Various frameworks exist to analyze the competitive environment of business ventures or projects and are useful in assessing their stated objectives and identifying the internal and external factors that are favorable and unfavorable to achieve those objectives. These are important tools for assessing compatibility and attainability of the stated objective with the competitive reality. With the implementation of the right competitive strategies, a company can sustain its positive growth and high rates of return-- the two most important value drivers. 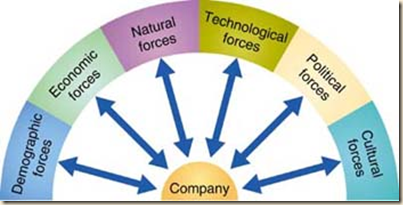 A company can either position itself to deflect the effect of the competitive forces in the industry (defensive strategy)-- through investing in technology that will lower production costs or through increased advertising and creating a strong brand; or it will use its strengths to affect the competitive forces in the industry (offensive strategy). Both, the defensive and offensive competitive strategies can incorporate low cost and differentiation strategy. SWOT analysis is a strategic planning method used to evaluate the Strengths, Weaknesses/Limitations, Opportunities, and Threats involved in a project or in a business venture. It involves specifying the objective of the business venture or project and identifying the internal and external factors that are favorable and unfavorable to achieve that objective. The existence of products outside of the realm of the common product boundaries increases the propensity of customers to switch to alternatives. Note that this should not be confused with competitors' similar products but entirely different ones instead. For example, tap water might be considered a substitute for Coke, whereas Pepsi is a competitor's similar product. Increased marketing for drinking tap water might "shrink the pie" for both Coke and Pepsi, whereas increased Pepsi advertising would likely "grow the pie" (increase consumption of all soft drinks), albeit while giving Pepsi a larger slice at Coke's expense. An extension to Porter: Using game theory, the concept of complementors was added, helping to explain the reasoning behind strategic alliances. Complementors are businesses that directly sell a product (or products) or service (or services) that complement the product or service of another company by adding value to mutual customers; for example, Intel and Microsoft (Pentium processors and Windows), or Microsoft and McAfee (Microsoft Windows & McAfee anti-virus). An extension to Porter: Government (national and regional) as well as Pressure Groups as notional external forces. These can be positive or negative, and usually come in the form of regulation, legislation, subsidies, grants, lawsuits, warnings, and simple rhetoric or protests. The resource-based view (RBV) as a basis for a competitive advantage of a firm lies primarily in the application of the bundle of valuable resources at the firm's disposal. To transform a short-run competitive advantage into a sustained competitive advantage requires that these resources are heterogeneous in nature and not perfectly mobile. Effectively, this translates into valuable resources that are neither perfectly imitable nor substitutable without great effort. If these conditions hold, the firm’s bundle of resources can assist the firm sustaining above average returns. The VRIO and VRIN model also constitutes a part of RBV. Identify the firm’s potential key resources. Valuable – A resource must enable a firm to employ a value-creating strategy, by either outperforming its competitors or reduce its own weaknesses. Relevant in this perspective is that the transaction costs associated with the investment in the resource cannot be higher than the discounted future rents that flow out of the value-creating strategy. Rare – To be of value, a resource must be rare by definition. In a perfectly competitive strategic factor market for a resource, the price of the resource will be a reflection of the expected discounted future above-average returns. In-imitable – If a valuable resource is controlled by only one firm it could be a source of a competitive advantage. This advantage could be sustainable if competitors are not able to duplicate this strategic asset perfectly. The term isolating mechanism was introduced by Rumelt (1984, p567) to explain why firms might not be able to imitate a resource to the degree that they are able to compete with the firm having the valuable resource. An important underlying factor of inimitability is causal ambiguity, which occurs if the source from which a firm’s competitive advantage stems is unknown. If the resource in question is knowledge-based or socially complex, causal ambiguity is more likely to occur as these types of resources are more likely to be idiosyncratic to the firm in which it resides. Conner and Prahalad go so far as to say knowledge-based resources are “…the essence of the resource-based perspective”. Non-substitutable – Even if a resource is rare, potentially value-creating and imperfectly imitable, an equally important aspect is lack of substitutability. If competitors are able to counter the firm’s value-creating strategy with a substitute, prices are driven down to the point that the price equals the discounted future rents, resulting in zero economic profits. Care for and protect resources that possess these evaluations, because doing so can improve organizational performance. Competitive advantage occurs when an organization acquires or develops an attribute or combination of attributes that allows it to outperform its competitors. These attributes can include access to natural resources, such as high grade ores or inexpensive power, access to highly trained and skilled personnel human resources, or new technologies such as robotics and information technology either to be included as a part of the product, or to assist in making it. STEEPLED analysis, (a derivative of PEST), describes a framework of macro-environmental factors used in the environmental scanning component of strategic management. It is a part of the external analysis when conducting a strategic analysis or doing market research, and gives an overview of the different macro-environmental factors that the company has to take into consideration. It is a useful strategic tool for understanding market growth or decline, business position, potential and direction for operations. Social factors include the cultural aspects and include health consciousness, population growth rate, age distribution, career attitudes and emphasis on safety. Trends in social factors affect the demand for a company's products and how that company operates. For example, an aging population may imply a smaller and less-willing workforce (thus increasing the cost of labor). Furthermore, companies may change various management strategies to adapt to these social trends (such as recruiting older workers). Technological factors include technological aspects such as R&D activity, automation, technology incentives and the rate of technological change. They can determine barriers to entry, minimum efficient production level and influence outsourcing decisions. Furthermore, technological shifts can affect costs, quality, and lead to innovation. Environmental factors include ecological and environmental aspects such as weather, climate, and climate change, which may especially affect industries such as tourism, farming, and insurance. Furthermore, growing awareness of the potential impacts of climate change is affecting how companies operate and the products they offer, both creating new markets and diminishing or destroying existing ones. These frameworks are useful when making a qualitative evaluation of the firm’s strategic position and competitive environment-- especially when used in conjunction with one another. When evaluating a company for the first time, it is often helpful to at least breeze through these items as a starting point or as a checklist, if for nothing else, to fully understand what you do and don’t know about your company and its industry, and to identify those areas that could be considered critical opportunities or deal breakers. A good investment thesis identifies both opportunities and threats. Some of those threats identified shall bear to pass and invalidate the investment thesis. We enter these investments with eyes wide open-- it is the nature of the risk-taking business. It is unacceptable, however, for any threat that could have been identified through this process (but wasn’t) to negatively impact your investment thesis. Any loss, due to the lack of analytical rigor, is a severe failure and unforgivable. The analyst should always perform some sort of cursory SWOT analysis when evaluating an opportunity, even if it’s just mentally. If the idea has merit and warrants further attention, then the analyst should assess the key resources using the Resource-Based View (RBV) analysis in conjunction with a stripped-down Competitive Force Analysis to gauge both the competitive advantage and market opportunity. If the idea still has merit and warrants further attention, the Competitive Force Analysis should be fully evaluated to determine the competitive intensity and profitability of the market, and the STEEPLED analysis sketched out to assess macroenvironmental factors. If the idea still has merit and warrants further attention, determine the relative importance of the STEEPLED analysis factors based on opportunity’s industry and the goods it produces, and to the extent that the factors haven’t been covered elsewhere, complete the analysis. Like all general frameworks, use this analysis such that it fits the specifics about the particular situation you are evaluating. You may not find all aspects relevant.